I have a small handful of shops I mean to check out when I visit Kyoto. Inoichi has been on that list, but last time I tried to go there, it was randomly closed. There was room for a line, but luckily there were plenty of seats in the restaurant. They specialize in shoyu ramen, available in the dark black or light white. I decided to go for the white. This may have been shoyu, but if I hadn't been explicitly told, I would have guessed it was a light shio. It was thin and salty in a good way; the kind of ramen that won't wreck your stomach. The noodles were round slippery straws, good and easy to slurp. The jelly-like egg and dark, thick chunks of menma were the highlights of the toppings. Yuzu and tororo konbu were provided in addition; I'll never say no to some citrus in my soup, but the tororo konbu was a bit too close to seawater for my taste. It was good; I might stop in again and try the black. 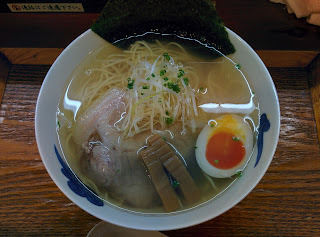 If you're in Kyoto and looking for a shio-equivalent, this is a gem.